Jorson and Carlson tabs and wafer seals are made from a certified, litho-coated, moisture treated face stock to provide consistent high speed application and 50-50 fold over sealing. The adhesive is specifically designed for high initial stick to a wide range of material surfaces. 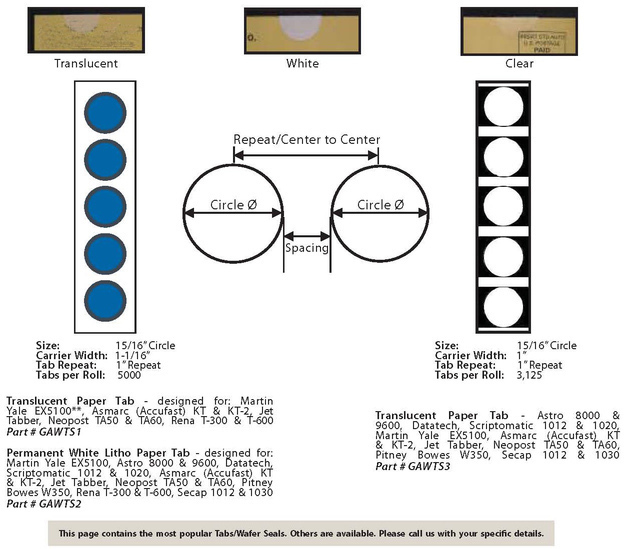 The 50lb backing sheet is custom treated for the high speed dispensing of small labels. The tabs and wafer seals meet or exceed postal compliance requirements for adhesion to surface “a through h,” and also comply with or exceed tensile strength requirements “type I and type II.” Made in the USA. O.E.M. TRADE NAMES, BRANDS AND TRADEMARKS ARE PROPERTY OF THEIR RESPECTIVE COMPANIES. JORSON AND CARLSON DOES NOT IMPLY WE OFFER GENUINE O.E.M. PARTS.